Sacagawea (Sakakawea, Sacajawea, Sacajewea; (c. 1787 – December 20, 1812 or April 9, 1884) was a Native American woman of the Shoshone tribe who accompanied the Corps of Discovery with Meriwether Lewis and William Clark in their exploration of the Western United States, traveling thousands of miles from North Dakota to the Pacific Ocean between 1804 and 1806. Clark later wrote of her to her husband: “your woman who accompanied you that long dangerous and fatigueing rout to the Pacific Ocean and back diserved a greater reward for her attention and services on that rout than we had in our power to give her.”  She was nicknamed Janey by some members of the expedition. Sacagawea was born to the Agaidika ("Salmon Eater") tribe of Shoshone between Kenney Creek and Agency Creek, near what is now the city of Tendoy in Lemhi County, Idaho. However, in 1800, when she was about 11 or 12, she was kidnapped by a group of Hidatsa in a battle that resulted in the death of four Shoshone men, four women and several boys. She was then taken to their village near the present Washburn, North Dakota. Therefore she grew up culturally affiliated with this tribe. Some believe her name is taken from the Hidatsa phrase for "bird woman," that may have been an adaptation or translation of her Shoshone birth name. The origins and proper pronunciation of her name has become a great point of controversy and contention among interested historians and her brother Cameahwait's descendants (Sacagawea has no known direct descendants). At the age of about 15, Sacagawea was taken as a wife by the French trapper Toussaint Charbonneau, who had also taken another young Shoshone woman as a wife. Two different accounts survive of Charbonneau's acquisition of Sacagawea: he either purchased both wives from the Hidatsa, or he won Sacagawea while gambling. Sacagawea was pregnant with her first child when the Corps of Discovery arrived near the Hidatsa villages to spend the winter of 1804-1805. Lewis and Clark built Fort Mandan and interviewed several trappers who might be able to translate or guide the expedition further up the river. They agreed to hire Charbonneau as an interpreter when they discovered his wife spoke Shoshone, as they knew they would need the help of the Shoshone tribes at the headwaters of the Missouri River. "a french man by Name Chabonah, who speaks the Big Belly (Gros Ventre) language visit us, he wished to hire and informed us his 2 squars were snake (Shoshone) Indians, we enga(ge) him to go on with us and take one his wives to interpret the Snake language…"
Charbonneau and Sacagawea moved into the fort a week later. Lewis himself assisted at the birth of Jean Baptiste Charbonneau on February 11, 1805, administering crushed rattlesnake rattles to speed the delivery. The boy was called "Pomp" or "Pompy," meaning first-born, by Clark and others in the expedition. Contrary to a common romantic view, Sacagawea did not "guide Lewis and Clark across the continent." She did offer some geographic guidance and confirmation as the expedition was approaching the Three Forks area where she had lived as a child. Sacagawea also instructed Lewis on which plants were edible/useful to the party, translated when they met the Shoshone (the original purpose for which she was brought along), and served as a passive goodwill ambassador. The presence of a woman and child with the group served as a signal that the expedition, while armed, was an essentially peaceful undertaking. In one noted act on May 14, 1805 as the expedition moved up the Missouri River, Sacagawea rescued items that had fallen out of a capsized boat, including the journals and records that Lewis and Clark were keeping. The corps commanders, who praised her quick action on this occasion, would name the Sacagawea River in her honor. By August of 1805 the corps had located a Shoshone tribe and were attempting to trade for horses to cross the Rocky Mountains. Sacagawea was brought in to translate, and it was discovered the tribe's chief was her brother Cameahwait. "August 17 Satturday 1805 The Interpreter & Squar who were before me at Some distance danced for joyful sight, and She make signs to me that they were her nation [...] the meeting of those people was effecting, particular between Sah cah gar we ah and an Indian woman, who had been taken prisoner at the same time with her and who, had afterwards escaped from the Minnetares Hidatsa and rejoined her nation…"
"one of the Indians had on a roab made of 2 Sea Otters Skins the fur of them were more butifull than any fur I had ever seen both Capt. Lewis & my Self endeavored to purchase the roab with differant articles at length we precurred it for a belt of blue beeds which the - wife of our interpreter Shabono wore around her waste…"
When the corps reached the Pacific Ocean at last, all members of the expedition — including Sacagawea — were allowed to participate in a November 24 vote on the location where they would build their fort for the winter. In January, when a whale's carcass washed up onto the beach south of Fort Clatsop, she insisted upon her right to go visit this great wonder. Charbonneau and Sacagawea spent three years among the Hidatsa after the expedition, before accepting William Clark's invitation to settle in St. Louis, Missouri in 1809. They entrusted Jean-Baptiste's education to Clark, who enrolled the young man in the Saint Louis Academy boarding school. Sacagawea gave birth to a daughter, Lisette or Lizette, sometime after 1810. According to Bonnie "Spirit Wind-Walker" Butterfield, historical documents suggest Sacagawea died in 1812. An 1811 journal entry made by Henry Brackenridge, a fur dealer at Fort Manuel Lisa Trading Post on the Missouri River, stated that both Sacagawea and Charbonneau were living at the fort. He recorded that Sacagawea "… had become sickly and longed to reviste her native country." The following year, John Luttig, a clerk at Fort Manuel Lisa recorded in his journal on December 20, 1812, that "… the wife of Charbonneau, a Snake Squaw (the common term used to denote Shoshone women), died of putrid fever." He went on to say that she was "aged about 25 years. She left a fine infant girl". Documents held by Clark show that her son Baptiste had already been entrusted by Charbonneau into Clark's care for a boarding school education, at Clark's insistence (Jackson, 1962). A few months later, 15 men were killed in an Indian attack on Fort Manuel Lisa, located at the mouth of the Bighorn River. John Luttig and Sacagawea's young daughter were among the survivors. Some say Toussaint Charbonneau was killed at this time; others say he signed over formal custody of his son to Clark in 1813. An adoption document made in the Orphans Court Records in St. Louis, Missouri states that "On August 11, 1813, William Clark became the guardian of "Tousant Charbonneau, a boy about ten years, and Lizette Charbonneau, a girl about one year old." For a Missouri State Court at the time, to designate a child as orphaned and to allow an adoption, both parents had to be confirmed dead in court papers. It is not believed that Lizette survived childhood, as there is no later record of her among Clark's paper. Reliable historical information about Sacagawea is extremely limited and no contemporary portraits of her exist. Her role in the expedition and this lack of record evidence led to a number of myths surrounding the girl, most notably that she was romantically involved with Lewis or Clark during their expedition. While the journals show that she was friendly with Clark and would often do favors for him, the idea of a liaison between them is believed to have been created by novelists who wrote about the expedition much later. Some Native American oral traditions are said to relate that rather than dying in 1812, Sacagawea left her husband Charbonneau and fell in with a band of Comanche on the Great Plains while making her way back towards her homeland. She is said to have married into their tribe, then left again after her husband was killed, eventually finding her way back to the Lemhi Shoshone in Wyoming. A Shoshone woman named Porivo ("chief woman") died at the Wind River Indian Reservation in Wyoming on April 9, 1884. Reverend John Roberts, who officiated at the funeral, claimed after her death that she had been Sacagawea, a belief widely disseminated in the United States by the novelist Grace Hebard who wrote a 1933 novel called Sacagawea. In 1963 a monument to "Sacajawea of the Shoshonis" was erected on a Shoshone reservation near Lander, Wyoming on the basis of this claim. In 1925, Dr. Charles Eastman, a Dakota Sioux physician, was hired by the Bureau of Indian Affairs to locate Sacagawea's remains. Eastman visited many different Native American tribes to interview individuals that might have known or heard of Sacagawea, although not the Agaidika Shoshone (who were confined at Fort Hall Indian Reservation, not at Wind River). It was his conclusion that the Shoshone woman named Porivo was Sacagawea. These popular fictionalized historical novels have varying degrees of historical accuracy, which is unfortunate as they shaped much of the popular American understanding of the expedition. Sacagawea is a 2002 play by playwright Eric Coble. Lake Sakakawea in North Dakota. USS Sacagawea, one of several United States ships named in her honor, the latest USNS Sakagawea was launched in June 2006 as a cargo ship. Sacagawea dollar, a golden coin issued in 2000 by the U.S. mint. Cheney, Washington, by Harold Balazs: A statue of Sacagawea is displayed in the rose garden in front of the President’s House at Eastern Washington University. 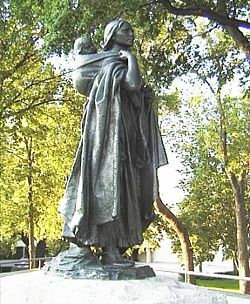 Bismarck, North Dakota, by Leonard Crunelle: A statue of Sacagawea and baby Pomp appears on the grounds of the North Dakota State Capitol, and a replica of it represents North Dakota in the National Statuary Hall in the United States Capitol. Interestingly, a North Dakota law, on the books for over a century, prohibits any statuary whatsoever on State-owned grounds, so a special law had to be passed in order to permit the display on the Capitol grounds, where it occupies a place of prestige on the lawn in front of the capitol building. St Louis, Missouri, by Harry Weber: A statue of Sacagawea with her baby in a cradle board is included in the diorama of the Lewis & Clark expedition that is on display in the lobby of the St. Louis Drury Plaza Hotel, located in the historical International Fur Exchange building. Godfrey, Illinois, by Glenna Goodacre: At Lewis and Clark Community College; by the same artist who designed the image on the Sacagawea dollar. Charlottesville, Virginia, by Charles Keck: A statue of Meriwether Lewis, William Clark and Sacagawea was sculpted in 1919. Boise, Idaho: Installed in front of the Idaho History Museum in July 2003. Great Falls, Montana, by Robert Scriver: Bronze 3/4 scale statue of Sacagawea, her baby Jean-Baptise, Lewis, Clark, and the Newfoundland dog Seaman, at the Lewis and Clark National Historic Trail Interpretive Center in Great Falls, Montana. Fort Benton, Montana, by Robert Scriver: A sculpture of Sacagawea and her baby, and Captains Lewis and Clark, in the riverside sculpture park. ↑ Donald Jackson, ed. (1962). Letters of the Lewis & Clark Expedition With Related Documents: 1783-1854. (Champaign/Urbana: University of Illinois Press). ↑ SacajaweaHome.Com, Lemhi County Historical Museum. Retrieved January 22, 2008. ↑ Rozina George. Agaidika Perspective on Sacajawea", Life Long Learning: The Lewis and Clark Rediscovery Project. Retrieved January 22, 2008. ↑ Stella M. Drumm, ed. (1920). "Journal of a Fur-trading Expedition on the Upper Missouri: John Luttig, 1812-1813". St. Louis: Missouri Historical Society. ↑ Bonnie Butterfield, "Spirit Wind-Walker". "Sacagawea: Captive, Indian Interpreter, Great American Legend: Her Life and Death. Retrieved January 22, 2008. ↑ Lewis and Clark Trail. Retrieved January 22, 2008. ↑ The Sacajawea Center, Salmon, Idaho.Retrieved January 22, 2008. ↑ Biography and Photo of the Statue of Sacagawea, at the National Statuary Hall in Washington, D.C.Retrieved January 22, 2008. ↑ "Late May 1805" diorama by Harry Weber.Retrieved January 22, 2008. ↑ "Sacajawea and Jean-Baptiste", sculpted by Alice Cooper.Retrieved January 22, 2008. Hebard, Grace Raymond, "Pilot of First White Men to Cross the American Continent" Journal of American History 1907. The Journals of the Lewis and Clark Expedition , University of Nebraska-Lincoln (in progress). Retrieved January 22, 2008. Schroer, Blanche, "A Compendium of Information About the Bird Woman: Her Death and Burial." Montana: The Magazine of Western History 27(2) (1997). Schroer, Blanche "Boat-pusher or Bird-Woman? Sacagawea or Sacajawea?" Annals of Wyoming 52 (1) (1970). This page was last modified on 23 July 2015, at 16:42.